Traveling to the Cuyamungue Institute this summer? Almost all who fly to New Mexico arrive via the Albuquerque Airport. You may want to schedule some extra time to visit some of the interesting sites in Albuquerque. Albuquerque, New Mexico’s largest city, was founded in 1660 with land grants to more than 100 Spanish families from the Duke of Albuquerque. Today it is one of the Jewels of the Land of Enchantment. We go back to the earliest history by visiting the Petroglyph National Monument, just West and North of the city. The Monument features thousands of petroglyphs, which are pictures carved on the basalt lava rocks. Most of these petroglyphs were made 400 to 700 years ago by the native Pueblo people. Some might date back 2,000 to 3,000 years. Others are from the modern era of the Hispanics and more frequent explorers. Three viewing sections are available to the visitor. The most popular area is Boca Negra Canyon. This area is run by the city and there is a slight admission charge, if someone is at the gate. Three trails of varying lengths of five to fifteen minutes let the visitor view hundreds of these petroglyphs. Some of the designs are the human form, shaman, various animals of the area, and geometric designs. Watch out for rattlesnakes and keep on the trails. One mile south of the visitor center is Rinconada Canyon, which features a two and a half-mile round trip through the rocks. This trail is not paved. Further north is Piedras Marcadas Canyon with more petroglyphs. There is no fee at the National Monument and the hikes are self guided. Booklets about the trails and the petroglyphs can be purchased at the visitor center. Fourteen miles north of Petroglyph National Monument is Coronado State Monument. This is located on Rte 550 just outside of Bernalillo. The State Park commemorates two important occurrences. First is the Pueblo of Kuanua, begun in the 1300s. The 1500s formed over 1,200 rooms in buildings up to four stories high. Entrance was through the roof of these adobe homes. They were used as storage areas, kitchens, and general living quarters. The building were built around open courtyards, in which were sunken kivas. The kivas served as ceremonial chambers, almost like sweathouses. Here the men could have visions and dreams. Some of the kivas were round and others square. They were decorated with many pictographs, painting on the walls, depicting the life of the people and their dependence upon the elements, especially rain. Some of these pictographs can be seen in the visitor center. The Kuauans were both hunter-gatherers and farmers raising the three sisters (corn, beans, and squash). Located by the Rio Grande River, the site was perfect for irrigation. In 1540 and event happened which changed the life of the Kuaua people. An army of Spanish soldiers, led by Francisco Vasquez de Coronado, encamped near Kuaua. Their purpose was to find the seven cities of gold, of which rumors abounded. Instead they commandeered the pueblo and made the Kuaua pay tribute to the Spanish Government. They had to give fifty percent of their produce to the government. The friars reeducated the natives and demanded labor from them, and eventually took the children to be raised as good Spanish Citizens. They undermined the stability of the pueblo and essentially destroyed its function. In 1680s the Natives revolted from 100 years of oppression. Natives from many of the Pueblos in New Mexico rose up and attacked the settlers, the churches, and the soldier garrisons. They drove the Spanish back to El Paso. The settlers and ranchers did not return for twelve years. Most probably this is when the Kuaua Pueblo was abandoned. One good aspect did emerge from the Pueblo Revolts. The Spanish policy of forced labor or poorly paid labor was changed. No longer were the Native subjected to this form of almost slave labor. This had a great effect on the treatment of the Natives in the San Antonio, Texas Missions and other missions, which were formed. Today Coronado State Park preserves and celebrates these events. The kiva is under reconstruction. Walkways with kiosks describe the life of the pueblo and of the people. Many of the foundations are visible. The staff is very friendly and informative. Travel east on Rte 550 and it changes into Rte 165. Drive through Placitas and up Mount Sandia. The road changes from nicely paved to gravel. It is closed in the winter because of snow and flooding water. Unfortunately, signs said the road was closed. Why go there? Up in to mountains is perhaps the oldest dated cave settlement in North America. More than 27,000 years ago man hunted the Wooly Mammoth in the Sandia Mountains. There are no human remains, but the artifacts found in the cave have been carbon dated. A small parking lot is at the ten-minute walk trailhead. This leads to Sandia Man Cave. Bring a flashlight. There are also some tight squeezes in the cave itself. Visit the New Mexico Museum of Natural History and Science for a great experience. The emphasis is on the evolution of the earth and life on the planet. Great exhibits on the development of dinosaurs. Some of the movies are breath taking. The animation is top rate. Experience “A Bad Day in the Cretaceous”, a video animation of a 10 K meteor which struck the earth near the Yucatan Peninsula. The crater is still there today. The resulting fires and devastation wipes out 75% of wildlife on the planet. It marked the end of the Cretaceous era. Also take a six-minute ride in the time travel machine, which takes you back 75 million years where present-day New Mexico stood. Other exhibits include gemstones, caving experiences (dry cave, wet cave, and live in a cave). Many interactive exhibits keep the visitor invested in the information. Also available at the museum for an additional fee are a planetarium and a Dynamax theater with different movies. Spend at least two hours in the museum to see the primary exhibits. A short distance away is the Turquoise Museum. This is another little gem. This museum shows everything you ever wanted to know about turquoise. How it is formed. Where it is mined. How to tell the different qualities and value of turquoise. You will spend about one hour to see the museum. It also contains a lapidary workshop with all of the tools to cut, polish, and grade the stone. The exhibit includes stones from all over the world. When you leave the museum, the exit is into a flower shop, which is behind the turquoise store. You can purchase beautiful turquoise jewelry too. Twenty-five miles North East is the final little gem of the day before we get to the giant gem. This is Tinkertown. This museum displays the life work of Ross J. Ward, a master carver. While we were watching television he carves a complete Western Town and a circus with a big top and a side show alley. Pushing a button animates many of the pieces. What makes Tinkertown such a pleasure is the humor Ward put into each piece. He has signs with corny sayings, people doing unusual things, and just living life in the old West. He has one display of the undertaker: “Be nice to the undertaker. He is the last one to let you down”. This is complete with horse drawn hearse and devils and angels flying in the sky. One final oddity about the museum is the surrounding walls: glass bottles held together with mortar (interesting). Now to the Giant Gem: Sandia Crest. Sandia Crest overlooks Albuquerque at an elevation of 10,678. Albuquerque stands at 5,000 feet. There are two major ways of getting to the top. First is the Sandia Peak Aerial Tramway, one of the world’s longest ones at 2.7 miles in length. During the month of April maintenance work keeps it closed. The other way up the mountain is drive, bicycle, or hike. We chose to drive the mountain on a paved road. The road ascends almost six thousand feet within fourteen miles. The temperature in Albuquerque at that time was 79? F and 49? F at the summit with a stiff breeze. Even in late April, there was snow on the ground. Almost felt like I was back in Chicago. The views are breath taking. At the top of the mountain are a souvenir store and a small restaurant. The old town section is quite nice. San Felipe de Neri has been the cornerstone of the plaza since 1706. Homes, shops and restaurants built around the plaza with narrow streets. In the center of the plaza is a gazebo and two replica canons from the Civil War days guard the plaza. The Albuquerque Museum of Art and History is two blocks from old town. The museum features permanent and traveling exhibits. The permanent exhibit includes 400 years of history in the area. The temporary exhibit was on the Alvarado Hotel in Albuquerque, which was a premier Harvey House in its day. Nearby is the Indian Pueblo Cultural Center. The center features a museum with Display cases for many of the different pueblos. Each one has representations of their arts and crafts and a history of the pueblo people. On weekends, in the courtyard, native dancers demonstrate some of their dances. The center has an extensive store and a restaurant. The AAA Book says that the Rio Grande Zoo in Albuquerque is a little gem. They are understating the fact. The zoo is a precious jewel, not to be missed. The layout is user friendly with many benches on which to rest. The animals seem to be well cared for. The landscaping is marvelous. The zoo is definitely five stars. The animals must be somewhat happy even in their confinement, because the white rhinos were putting on an adult show for us. A docent said that they had good luck with reproduction at the zoo. The lions, tigers, and other great cats were doing their cat like thing: napping. Many exhibits also include water animals. Sometimes I wondered if I was in an aquarium rather than a zoo. 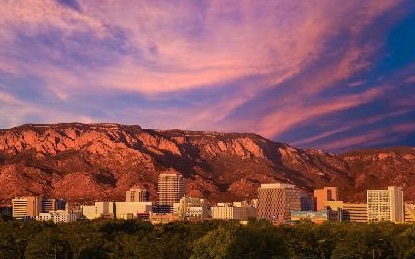 Before coming to Albuquerque, visitors should be aware of the city’s high elevation of over 5,000 feet. Cuyamungue is over 6000 feet. When visiting New Mexico, it may take your body a couple of days to adjust to the high altitude. At this elevation the air is thinner and you may become tired faster during physical activity. The high desert climate also causes people to dehydrate faster. It is important to drink a lot of water to keep your body hydrated; this is the easiest way to avoid altitude sickness. If you plan on visiting any of the great selection of restaurants while in town, you should be aware that alcohol may affect your body faster at higher elevations as well. Also, sunscreen is vital while vacationing in Albuquerque. Whether it is sunny or cloudy, summer or winter, the UV rays are stronger at higher altitudes. Visitors should wear a high SPF sunscreen at all times to avoid sunburn and wear sunglasses to protect their eyes.